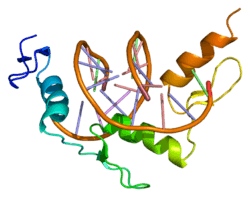 Early growth response protein 2 is a protein that in humans is encoded by the EGR2 gene. ↑ "Entrez Gene: EGR2 early growth response 2 (Krox-20 homolog, Drosophila)". ↑ Boerkoel CF, Takashima H, Bacino CA, Daentl D, Lupski JR (Jul 2001). "EGR2 mutation R359W causes a spectrum of Dejerine-Sottas neuropathy". Neurogenetics. 3 (3): 153–7. doi:10.1007/s100480100107. PMID 11523566. ↑ Warner LE, Mancias P, Butler IJ, McDonald CM, Keppen L, Koob KG, Lupski JR (Apr 1998). "Mutations in the early growth response 2 (EGR2) gene are associated with hereditary myelinopathies". Nature Genetics. 18 (4): 382–384. doi:10.1038/ng0498-382. PMID 9537424. ↑ Chandra, Abhishek; Lan, Shenghui; Zhu, Ji; Siclari, Valerie A.; Qin, Ling (2013-07-12). "Epidermal Growth Factor Receptor (EGFR) Signaling Promotes Proliferation and Survival in Osteoprogenitors by Increasing Early Growth Response 2 (EGR2) Expression". Journal of Biological Chemistry. 288 (28): 20488–20498. doi:10.1074/jbc.M112.447250. ISSN 0021-9258. PMC 3711314 . PMID 23720781. ↑ Grünewald, Thomas G P; Bernard, Virginie; Gilardi-Hebenstreit, Pascale; Raynal, Virginie; Surdez, Didier; Aynaud, Marie-Ming; Mirabeau, Olivier; Cidre-Aranaz, Florencia; Tirode, Franck. "Chimeric EWSR1-FLI1 regulates the Ewing sarcoma susceptibility gene EGR2 via a GGAA microsatellite". Nature Genetics. 47 (9): 1073–1078. doi:10.1038/ng.3363. PMC 4591073 . PMID 26214589. Rangnekar VM, Aplin AC, Sukhatme VP (May 1990). "The serum and TPA responsive promoter and intron-exon structure of EGR2, a human early growth response gene encoding a zinc finger protein". Nucleic Acids Research. 18 (9): 2749–57. doi:10.1093/nar/18.9.2749. PMC 330760 . PMID 2111009. Chavrier P, Janssen-Timmen U, Mattéi MG, Zerial M, Bravo R, Charnay P (Feb 1989). "Structure, chromosome location, and expression of the mouse zinc finger gene Krox-20: multiple gene products and coregulation with the proto-oncogene c-fos". Molecular and Cellular Biology. 9 (2): 787–97. doi:10.1128/mcb.9.2.787. PMC 362656 . PMID 2496302. Joseph LJ, Le Beau MM, Jamieson GA, Acharya S, Shows TB, Rowley JD, Sukhatme VP (Oct 1988). "Molecular cloning, sequencing, and mapping of EGR2, a human early growth response gene encoding a protein with "zinc-binding finger" structure". Proceedings of the National Academy of Sciences of the United States of America. 85 (19): 7164–8. doi:10.1073/pnas.85.19.7164. PMC 282144 . PMID 3140236. Topilko P, Schneider-Maunoury S, Levi G, Baron-Van Evercooren A, Chennoufi AB, Seitanidou T, Babinet C, Charnay P (Oct 1994). "Krox-20 controls myelination in the peripheral nervous system". Nature. 371 (6500): 796–9. doi:10.1038/371796a0. PMID 7935840. Sham MH, Vesque C, Nonchev S, Marshall H, Frain M, Gupta RD, Whiting J, Wilkinson D, Charnay P, Krumlauf R (Jan 1993). "The zinc finger gene Krox20 regulates HoxB2 (Hox2.8) during hindbrain segmentation". Cell. 72 (2): 183–96. doi:10.1016/0092-8674(93)90659-E. PMID 8093858. Levi G, Topilko P, Schneider-Maunoury S, Lasagna M, Mantero S, Pesce B, Ghersi G, Cancedda R, Charnay P (Jun 1996). "Role of Krox-20 in endochondral bone formation". Annals of the New York Academy of Sciences. 785: 288–91. doi:10.1111/j.1749-6632.1996.tb56286.x. PMID 8702157. Warner LE, Mancias P, Butler IJ, McDonald CM, Keppen L, Koob KG, Lupski JR (Apr 1998). "Mutations in the early growth response 2 (EGR2) gene are associated with hereditary myelinopathies". Nature Genetics. 18 (4): 382–4. doi:10.1038/ng0498-382. PMID 9537424. Warner LE, Svaren J, Milbrandt J, Lupski JR (Jul 1999). "Functional consequences of mutations in the early growth response 2 gene (EGR2) correlate with severity of human myelinopathies". Human Molecular Genetics. 8 (7): 1245–51. doi:10.1093/hmg/8.7.1245. PMID 10369870. Timmerman V, De Jonghe P, Ceuterick C, De Vriendt E, Löfgren A, Nelis E, Warner LE, Lupski JR, Martin JJ, Van Broeckhoven C (Jun 1999). "Novel missense mutation in the early growth response 2 gene associated with Dejerine-Sottas syndrome phenotype". Neurology. 52 (9): 1827–32. doi:10.1212/wnl.52.9.1827. PMID 10371530. Bellone E, Di Maria E, Soriani S, Varese A, Doria LL, Ajmar F, Mandich P (Oct 1999). "A novel mutation (D305V) in the early growth response 2 gene is associated with severe Charcot-Marie-Tooth type 1 disease". Human Mutation. 14 (4): 353–4. doi:10.1002/(SICI)1098-1004(199910)14:4<353::AID-HUMU17>3.0.CO;2-4. PMID 10502832. Pareyson D, Taroni F, Botti S, Morbin M, Baratta S, Lauria G, Ciano C, Sghirlanzoni A (Apr 2000). "Cranial nerve involvement in CMT disease type 1 due to early growth response 2 gene mutation". Neurology. 54 (8): 1696–8. doi:10.1212/wnl.54.8.1696. PMID 10762521. Gambardella L, Schneider-Maunoury S, Voiculescu O, Charnay P, Barrandon Y (Sep 2000). "Pattern of expression of the transcription factor Krox-20 in mouse hair follicle". Mechanisms of Development. 96 (2): 215–8. doi:10.1016/S0925-4773(00)00398-1. PMID 10960786. Yoshihara T, Kanda F, Yamamoto M, Ishihara H, Misu K, Hattori N, Chihara K, Sobue G (Mar 2001). "A novel missense mutation in the early growth response 2 gene associated with late-onset Charcot--Marie--Tooth disease type 1". Journal of the Neurological Sciences. 184 (2): 149–53. doi:10.1016/S0022-510X(00)00504-9. PMID 11239949. Boerkoel CF, Takashima H, Bacino CA, Daentl D, Lupski JR (Jul 2001). "EGR2 mutation R359W causes a spectrum of Dejerine-Sottas neuropathy". Neurogenetics. 3 (3): 153–7. doi:10.1007/s100480100107. PMID 11523566. Yang Y, Dong B, Mittelstadt PR, Xiao H, Ashwell JD (May 2002). "HIV Tat binds Egr proteins and enhances Egr-dependent transactivation of the Fas ligand promoter". The Journal of Biological Chemistry. 277 (22): 19482–7. doi:10.1074/jbc.M201687200. PMID 11909874. Vandenberghe N, Upadhyaya M, Gatignol A, Boutrand L, Boucherat M, Chazot G, Vandenberghe A, Latour P (Dec 2002). "Frequency of mutations in the early growth response 2 gene associated with peripheral demyelinating neuropathies". Journal of Medical Genetics. 39 (12): e81. doi:10.1136/jmg.39.12.e81. PMC 1757229 . PMID 12471219. Musso M, Balestra P, Taroni F, Bellone E, Mandich P (Feb 2003). "Different consequences of EGR2 mutants on the transactivation of human Cx32 promoter". Neurobiology of Disease. 12 (1): 89–95. doi:10.1016/S0969-9961(02)00018-9. PMID 12609493. Unoki M, Nakamura Y (Apr 2003). "EGR2 induces apoptosis in various cancer cell lines by direct transactivation of BNIP3L and BAK". Oncogene. 22 (14): 2172–85. doi:10.1038/sj.onc.1206222. PMID 12687019. Numakura C, Shirahata E, Yamashita S, Kanai M, Kijima K, Matsuki T, Hayasaka K (Jun 2003). "Screening of the early growth response 2 gene in Japanese patients with Charcot-Marie-Tooth disease type 1". Journal of the Neurological Sciences. 210 (1-2): 61–4. doi:10.1016/S0022-510X(03)00028-5. PMID 12736090.